with over 80 mosques and several important gongbei shrine complexes (example pictured), Linxia City is known as "China's little Mecca"? the Haramain High Speed Rail Project in Saudi Arabia, will run for 444 km (276 mi) between the Islamic holy cities of Medina and Mecca with 320-km/h (200-mph) electric trains? Hilf al-Fudul was a 7th-century alliance created by various Meccans, most notably Muhammad, to establish fair commercial dealing? Mecca (pronounced /ˈmɛkə/), also spelled Makkah (English: /ˈmækə/; Arabic: مكة‎ Makkah and in full: Arabic: مكّة المكرمة‎ transliterated Makkah Al Mukarrammah [mækːæt ælmukarːamæ]) is the holiest meeting site in Islam, closely followed by Medina. The city is modern, cosmopolitan and while being closed to non-Muslims, is nonetheless ethnically diverse. Muslim tradition attributes the beginning of Mecca to Ishmael's descendants. In the 7th century, the Islamic prophet Muhammad proclaimed Islam in the city which was by then an important trading center. After 966, Mecca was led by local sharifs until 1924 when the Ottoman Empire collapsed and it came under the rule of the Saudis. In its modern period, Mecca has seen tremendous expansion in size and infrastructure. The modern day city is the capital of Saudi Arabia's Makkah Province, in the historic Hejaz region. With a population of 1.7 million (2008), the city is located 73 km (45 mi) inland from Jeddah in a narrow valley at a height of 277 m (909 ft) above sea level. Mecca is the original English transliteration of the Arabic and is still most commonly used in English dictionaries, by international organisations in their English language literature and in academic writing. Mecca is governed by the Municipality of Mecca, a municipal council of fourteen locally elected members headed by a mayor (called an Amir) appointed by the Saudi Government. The current mayor of the city is Osama Al-Barr. According to Islamic tradition, the history of Mecca goes back to Abraham who built the Kaaba with the help of his eldest son Ishmael in around 2000 BCE when the inhabitants of what was then known as Bakkah had fallen away from the original monotheism of Abraham through the influence of the Amelkites. Over time, the Kaaba had become a repository for the idols and tribal deities of Arabia's pagan tribes. Mecca's most important pagan deity was Hubal, which had been placed there by the ruling Quraysh tribe and remained until the 7th century AD. Ptolemy may have called the city "Macoraba", though this identification is controversial. In the 5th century, the Quraysh took control of Mecca, and became skilled merchants and traders. In the 6th century they joined the lucrative spice trade as well, since battles in other parts of the world were causing trade routes to divert from the dangerous sea routes to the more secure overland routes. The Byzantine Empire had previously controlled the Red Sea, but piracy had been on the increase. Another previous route, that from the Persian Gulf via the Tigris and Euphrates rivers, was also being threatened by exploitation from the Sassanid Empire, as well as being disrupted by the Lakhmids, the Ghassanids, and the Roman–Persian Wars. Mecca's prominence as a trading center surpassed the cities of Petra and Palmyra. By the middle of the 6th century, there were three major settlements in northern Arabia, all along the south-western coast that borders the Red Sea, in a habitable region between the sea and the great desert to the east. This area, known as the Hejaz, featured three settlements grown around oases, where water was available. In the center of the Hijaz was Yathrib, later renamed Madinah, from "Madinatun Nabi," or "City of the Prophet." 250 mi (400 km) South of Yathrib was the mountain city Ta’if, north-west of which lay Mecca. Although the area around Mecca was completely barren, it was the wealthiest of the three settlements with abundant water via the renowned Zamzam Well and a position at the crossroads of major caravan routes. The harsh conditions and terrain of the Arabian peninsula meant a near-constant state of conflict between the local tribes, but once a year they would declare a truce and converge upon Mecca in an annual pilgrimage, which was originally initiated (in folklore) by Abraham as an act of worship of the One God but his descendents abandoned Abrahams faith over time and descended back to paganism. Up to the 7th century, this journey was intended for religious reasons by the pagan Arabs to pay homage to their shrine, and to drink from the Zamzam Well. However, it was also the time each year that disputes would be arbitrated, debts would be resolved, and trading would occur at Meccan fairs. These annual events gave the tribes a sense of common identity and made Mecca an important focus for the peninsula. Camel caravans, said to have first been used by Muhammad's great-grandfather, were a major part of Mecca's bustling economy. Alliances were struck between the merchants in Mecca and the local nomadic tribes, who would bring goods – leather, livestock, and metals mined in the local mountains – to Mecca to be loaded on the caravans and carried to cities in Syria and Iraq. Historical accounts also provide some indication that goods from other continents may also have flowed through Mecca. Supposedly goods from Africa and the Far East passed through on route to Syria including spices, leather, medicine, cloth, and slaves; in return Mecca received money, weapons, cereals and wine, which in turn were distributed throughout Arabia. The Meccans signed treaties with both the Byzantines and the Bedouins, and negotiated safe passages for caravans, giving them water and pasture rights. Mecca became the center of a loose confederation of client tribes, including the tribes of the Banu Tamim. Other regional powers such as the Abyssinian, Ghassan, and Lakhm were in decline leaving Meccan trade to be the primary binding force in Arabia in the late 6th century. Mount Nur is where Muhammad is believed to have received the first revelation from the Archangel Gabriel. Muhammad was born in Mecca in 570, and thus Islam has been inextricably linked with the city ever since. Muhammad was born in a minor faction, the Hashemites, of the ruling Quraysh tribe. It was in Mecca, in the nearby mountain cave of Hira, that he is said to have begun receiving divine revelations from God through the Angel Gabriel in 610 AD, and began to preach monotheism against Meccan animism. After enduring intense persecution from the pagan tribes for 13 years, Muhammad emigrated (see Hijra) in 622 with his companions to Yathrib (later called Madinah). The conflict between the Quraysh and the Muslims, however, continued: the two fought in the Battle of Badr, where the Muslims defeated the heavily-armed Quraysh army outside Madinah; while the Meccans narrowly overcame the Muslims at the Battle of Uhud. Overall, however, Meccan efforts to annihilate Islam proved to be very costly and ultimately unsuccessful. During the Battle of the Trench in 627, the combined armies of Arabia were unable to defeat Muhammad's forces. In 628, Muhammad and his followers peacefully marched to Mecca, attempting to enter the city for pilgrimage. Instead, however, they were blocked by the Quraysh, after which both Muslims and Meccans entered into the Treaty of Hudaybiyyah, whereby the Quraysh promised to cease fighting Muslims and promised that Muslims would be allowed into the city to perform the pilgrimage the following year. Two years later, however, the Quraysh violated the truce by slaughtering a group of Muslims and their allies. Muhammad and his companions, now 10,000 strong, decided to march into Mecca. However, instead of continuing their fight, the city of Mecca surrendered to Muhammad and his followers, who, rather than seeking revenge for years of severe persecution, declared amnesty for the inhabitants. The ancient pagan deities and artwork, including those that had been placed in the Kaabah, were destroyed by Muhammad and his followers and rededicated to the worship of the One God, the God of Abraham, Moses, Jesus and Muhammad. Muhammad declared Mecca as the holiest site in Islam ordaining it as the center of Muslim pilgrimage, one of the faith's Five Pillars. Muhammad declared that no non-Muslim would ever be allowed in the city again. Muhammad returned to Madinah, after assigning Akib ibn Usaid as governor of the city. 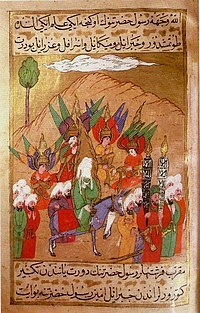 Muhammad's other activities in Arabia led to the unification of the peninsula, putting an end to the petty tribal wars that had disrupted life in the city for so long. Mecca was never capital of any of the Islamic states but Muslim rulers did contribute to its upkeep. During the reigns of Umar (c. 586-590-644 CE) and Uthman Ibn Affan (c. 579–656) concerns of flooding caused the caliphs to bring in Christian engineers to build barrages in the low-lying quarters and construct dykes and embankments to protect the area round the Kaaba. Muhammad's migration to Medina shifted the focus away from Mecca, this focus moved still more when the Umayyad Caliphate took power choosing Damascus in Syria as their capital. The Abbasid Caliphate moved the capital to Baghdad, in modern-day Iraq, which remained the center of the Islamic Empire for nearly 500 years. Mecca re-entered Islamic political history briefly when it was held by Abd-Allah ibn al-Zubayr, an early Muslim who opposed the Umayyad caliphs and again when the caliph Yazid I besieged Mecca in 683. For some time thereafter the city figured little in politics remaining a city of devotion and scholarship governed by the Hashemite Sharifs. In 930, Mecca was attacked and sacked by Qarmatians, a millenarian Ismaili Muslim sect led by Abu Tahir Al-Jannabi and centered in eastern Arabia. The Black Death pandemic hit Mecca in 1349. In 1803 the city was captured by the First Saudi State, which held Mecca until 1813. This was a massive blow to the prestige of the (Turkish) Ottoman Empire, which had exercised sovereignty over the holy city since 1517. The Ottomans assigned the task of bringing Mecca back under Ottoman control to their powerful viceroy of Egypt, Muhammad Ali Pasha. Muhammad Ali Pasha successfully returned Mecca to Ottoman control in 1813. In June 1916, During the Arab Revolt, the Sharif of Mecca, Hussein bin Ali revolted against the Ottoman Empire from Mecca and it was the first city captured by his forces following Battle of Mecca (1916). Sharif Hussein declared a new state, Kingdom of Hejaz, and declared Mecca as the capital of the new kingdom. Following the Battle of Mecca (1924), the Sharif of Mecca was overthrown by the Saud family, and Mecca was incorporated into Saudi Arabia. On November 20, 1979 two hundred armed Islamist dissidents led by Saudi preacher Juhayman al-Otaibi seized the Grand Mosque. They claimed that the Saudi royal family no longer represented pure Islam and that the sacred mosque and the Kaaba, must be held by those of true faith. The rebels seized tens of thousands of pilgrims as hostages and barricaded themselves in the mosque. The siege lasted two weeks, and resulted in several hundred deaths and significant damage to the shrine, especially the Safa-Marwa gallery. Pakistani forces carried out the final assault; they were assisted with weapons, logistics and planning by an elite team of French commandos from The French GIGN commando unit. On July 31, 1987, during an anti-US demonstration by pilgrims, 402 people were killed (275 Iranian Shia pilgrims, 85 Saudis [including policemen], and 45 pilgrims from other countries) and 649 wounded (303 Iranian Shia pilgrims, 145 Saudis [including policemen] and 201 pilgrims from other countries) after the Saudi police opened fire against the unarmed demonstrators. The main reason Muslims go to Mecca is to pray in the Holy Mosque. Often, they perform the Umrah, the lesser pilgrimage, while visiting the Holy Mosque. Once a year, the Hajj, the greater pilgrimage, takes place in Mecca and nearby sites. During the Hajj, three million people of all races worship in unison. Islam teaches that if a person performs the Umrah or the Hajj correctly and with sincere intentions (to please God), all his/her sins are forgiven. Every adult, healthy, sane Muslim who has the financial and physical capacity to travel to Mecca and can make arrangements for the care of his/her dependents during the trip, must perform the Hajj once in a lifetime. In 2009, the Hajj began on Wednesday, November 25. Mecca is at an elevation of 277 m (909 ft) above sea level, and approximately 50 mi (80 km) inland from the Red Sea. The city is situated between mountains, which has defined the contemporary expansion of the city. The city centers on the Masjid al-Haram area, whose elevation is lower than most of the city. The area around the mosque comprises the old city. The main avenues are Al-Mudda'ah and Sūq al-Layl to the north of the mosque, and As-Sūg Assaghīr to the south. As the Saudis expanded the Grand Mosque in the center of the city, where there were once hundreds of houses are now replaced with wide avenues and city squares. Traditional homes are built of local rock and are generally two to three stories. The total area of Mecca metro today stands over 1,200 km2 (460 sq mi). Central Mecca lies in a corridor between mountains, which is often called the "hollow of Mecca." Mecca's location was also important for trade, and it was the stop for important trade routes. Unlike other Saudi Arabian cities, Mecca retains its warm temperature in winter, which can range from 17 °C (63 °F) at midnight to 25 °C (77 °F) in the afternoon. Summer temperatures are considered very hot and break the 40 °C (104 °F) mark in the afternoon dropping to 30 °C (86 °F) in the evening. Rain usually falls in Mecca in small amounts between November and January. Expansion of the city is ongoing and includes the construction of 577 m (1,893 ft) tall Abraj Al Bait Towers across the street from the Grand Mosque. The towers are set to be completed in 2010 when they will be one of the world's tallest buildings. The Zamzam Well is another notable landmark mentioned elsewhere in this article. The Qishla of Mecca was an Ottoman castle facing the Grand Mosque and defending the city from attack. However, the Saudi government removed the structure to give space for hotels and business buildings near to the Grand Mosque. The city takes in more than $100 million, while the Saudi government spends about $50 million on services for the Hajj. There are some industries and factories in the city, but Mecca no longer plays a major role in Saudi Arabia's economy, which is mainly based on oil exports. The few industries operating in Mecca include textiles, furniture, and utensils. The majority of the economy is service oriented. Water is scarce and food must be imported via Shu'eyba water plant and Jeddah. Mecca's culture has been affected by the large number of pilgrims that arrive annually, and thus boasts a rich cultural heritage. The first press was brought to Mecca in 1885 by Osman Nuri Paşa, an Ottoman Wali. During the Hashemite period, it was used to print the city's official gazette, al-Qibla. The Saudi regime expanded this press into a larger operation, introducing the new Saudi official gazette Umm al-Qurā. Henceforth presses and printing techniques were introduced in the city from around the Middle East, mostly via Jeddah. Jeddah is served by one major Arabic-language newspaper, Shams. However, other Saudi and international newspapers are also provided in Mecca such as the Saudi Gazette, Medina, Okaz and Al-Bilad. The first three are Mecca's (and other Saudi cities') primary newspapers focusing mainly on issues that affect the city, with over a million readers. In pre-modern Mecca the most common sports were impromptu wrestling and foot races. Football is the most popular sport in Mecca, the city hosting some of the oldest sport clubs in Saudi Arabia such as, Al-Wahda FC (established in 1945). King Abdulaziz Stadium is the largest stadium in Mecca with capacity of 33,500. "Non-Muslim Bypass:" Non-Muslims are not permitted to enter Mecca. Non-Muslims are not permitted to enter Mecca under Saudi law. The existence of cities closed to non-Muslims and the mystery of the Hajjis have often aroused intense curiosity in people from around the world. Some have falsely claimed to be Muslims in order to visit the city of Mecca and the Grand Mosque to experience the Hajj for themselves. The first to leave a record was Ludovico di Varthema of Bologna in 1503. The most famous account of a foreigner's journey to Mecca is A Personal Narrative of a Pilgrimage to Mecca and Medina, written by Richard Francis Burton. Burton traveled as a Qadiriyyah Sufi from Afghanistan; his name, as he signed it in Arabic below his frontispiece portrait for The Jew The Gypsy and El Islam, was al-Hajj 'Abdullah. Individuals who use fake certificates of Muslim identity to enter may be arrested and prosecuted by Saudi authorities. The mixture of different ethnicities and nationalities amongst Meccan residents has significantly impacted Mecca's traditional cuisine. As in other Saudi cities Kabsa (a spiced dish of rice and meat) is the most traditional lunch but the Yemeni mandi (a dish of rice and tandoori cooked meat) is also popular. Grilled meat dishes such as shawarma (flat-bread meat sandwich), kofta (meatballs) and kebab are widely sold in Mecca. During Ramadan fava beans in olive oil and samosas are the most popular dishes and are eaten at dusk. These dishes are almost always found in Lebanese, Syrian, and Turkish restaurants. Population density in Mecca is very high. Most long-term residents of Mecca live in the Old City, and many work in the industry known locally as the Hajj Industry. As Iyad Madani, Saudi Arabia's minister for Hajj was quoted as saying, "We never stop preparing for the Hajj." Year-round, pilgrims stream into the city to perform the rites of Umrah, and during the last weeks of Dhu al-Hijjah, on average 4 million Muslims arrive in the city to take part in the rites known as Hajj. Pilgrims are from varying ethnicities and backgrounds, mainly from Africa, Central Asia, South Asia, Southeast Asia, Europe and the Middle East. Many of these pilgrims have remained and become residents of the city. As a result, Mecca is much more ethnically diverse than most Saudi cities and its culture is more eclectic in nature. Adding to the Hajj-related diversity, the oil-boom of the past 50 years has brought hundreds of thousands of working immigrants. Limited radio communication was established within the Hejaz region under the Hashimites. In 1929, wireless stations were set up in various towns of the region, creating a network that would become fully functional by 1932. Soon after World War II, the existing network was greatly expanded and improved. Since then, radio communication has been used extensively in directing the pilgrimage and addressing the pilgrims. This practice started in 1950, with the initiation of broadcasts the Day of Arafat, and increased until 1957, at which time Radio Makka became the most powerful station in the Middle East at 50 kW. Later, power was increased to 450 kW. Music was not immediately broadcast, but gradually introduced. The 18 km (11 mi) Al Mashaaer Al Mugaddassah Metro is under construction and is scheduled for completion in 2011. A total of 5 metro lines are planned to carry pilgrims to the religious sites. ^ Hoyle, Ben. "British architects to change the face of Mecca," The Times. November 29, 2008. ^ Fattah, Hassan M.Islamic Pilgrims Bring Cosmopolitan Air to Unlikely City, New York Times. January 20, 2005. ^ a b Mecca at Microsoft Encarta. Archived 2009-11-01. ^ Oxford English Dictionary (retrieved on 2009-09-24) indicates Mecca is the proper English language form and demonstrates the generic use of Mecca as in eg "a Mecca for holidaymakers"; there is no entry for Makkah as of 2009-09-24. ^ "Prince Abdul-Majid, Governor of Mecca, Dies at 65". Associated Press. May 7, 2007. http://www.nytimes.com/2007/05/07/world/middleeast/07abdul.html. Retrieved 2008-01-01. ^ "Mecca". Catholic Encyclopedia. New York: Robert Appleton Company. 1913. http://en.wikisource.org/wiki/Catholic_Encyclopedia_(1913)/Mecca. ^ "Weather averages for Mecca". PME. http://www.pme.gov.sa/Makkah.htm. Retrieved Aug 17, 2009. ^ "Shame of the House of Saud: Shadows over Mecca". The Independent (UK). 2006-04-19. http://news.independent.co.uk/world/middle_east/article358577.ece. Retrieved 2007-05-03. ^ "Saudi embassy warns against entry of non-Muslims in Mecca". ABS-CBN News. March 14, 2006. http://www.abs-cbnnews.com/storypage.aspx?StoryId=32627. Retrieved 2008-04-27. ^ A new National Geographic Special on PBS "Inside Mecca"
^ "Makkah al-Mukarramah and Medina". Encyclopedia Britannica. Fifteenth edition. 23. 2007. pp. 698–699. ^ a b "Mecca metro contracts signed". Railway Gazette International. June 24, 2009. http://www.railwaygazette.com/news/single-view/view//makkah-metro-contracts-signed.html. Retrieved 2009-06-25. Hawting, G. R. (1980). "The Disappearance and Rediscovery of Zamzam and the 'Well of the Ka'ba'". Bulletin of the School of Oriental and African Studies, University of London 43 (1): 44–54. http://links.jstor.org/sici?sici=0041-977X(1980)43%3A1%3C44%3ATDAROZ%3E2.0.CO%3B2-3. Arc. "Mecca." Trifter.com. Feb 18. 2009. <http://www.trifter.com/Asia-&-Pacific/Saudi-Arabia/Mecca.538297>. Mecca is a city in western Saudi Arabia that is considered holy in Islam as the birthplace of Muhammad and because of Kaaba Temple. If it is up to me, we are going to explain that an attack on this homeland of that nature would be followed by an attack on the holy sites in Mecca and Medina ... Because that's the only thing I can think of that might deter somebody from doing what they otherwise might do. Tom Tancredo, U.S. Representative, "Republican candidate advocates threat to bomb Islamic holy sites as response to terrorist attack on U.S.", International Herald Tribune, August 2, 2007. URL accessed on 2007-08-03. "Tancredo says threat of attack on holy sites would deter terrorism", IowaPolitics.com, 31 July 2007. URL accessed on 2007-08-03. For other places with the same name, see Mecca (disambiguation). Mecca or Makkah (in full:(مكة المكرمة Makkah al-Mukarramah), located in western Saudi Arabia, is the holiest city in Islam. As such it is forbidden for Non-Muslims to enter the city. A pilgrimage to Mecca, known as the Hajj, is one of the Five Pillars of Sunni Islam and one of the ten Branches of Religion in Shi'a Islam, and thus obligatory for all Muslims with the physical and financial ability to make it. Over three million Muslims visit the city during the month of Dhu'l-Hijjah yearly. Visits outside this month are known as minor pilgrimages or Umrah, and while not compulsory are strongly encouraged. WARNING: Non-Muslims are strictly prohibited from entering the holy city of Mecca. The penalty is deportation from the country. Documentation will be checked upon entry and anyone not showing proof of being Muslim will be denied entry. As a solitary exception, the Mecca bus terminal (outside city limits) is open to all. The government of Saudi Arabia issues special visas for those making the pilgrimage. Most pilgrims opt to use a specialist travel agency, which will handle the considerable paperwork for them, but detailed information on the strict requirements is available at the Ministry of Hajj . As usual in Saudi Arabia, women must travel together with a male guardian (Mahram), unless they are over 45, travelling with a group and have their guardian's signed consent. Visas are assigned to countries on a quota basis according to the number of Muslims they have. Recently, those who have previously been to Mecca have had additional restrictions placed on their entry, in an effort to discourage overcrowding while still accommodating those who have not yet made the pilgrimage. If the applicant was not born a Muslim, they must present a certificate testifying so, which has been notarized by an Islamic center. Usually your mosque will be able to arrange this or at least point the way. Jeddah is the gateway to Mecca. The Hajj Terminal at King Abdulaziz International Airport (IATA: JED), used only for the Hajj, is served mostly by charter flights, although there are also some scheduled services as well. During Umrah, scheduled services use the airport's other terminals. There is an excellent modern multi-lane highway from Jeddah. During the Hajj pilgrimage season it is jammed with buses full of pilgrims. At any other time, traffic is extremely light for the size of the road. A few miles outside Mecca, there is a cutoff referred to as the "Christian bypass". Turn along this highway to drive another 50 miles out of the way to reach the lovely mountain town of Taif. Taif, at 5000 feet elevation, was the former summer palace of the Saudi Kings. If you remain on the main highway, there is a police checkpoint just after the exit, where non-Muslims are kept out of the holy city. SAPTCO runs services to Mecca from throughout the country, although most pilgrims arrive on privately chartered buses from Jeddah. There are two terminals: the main terminal outside city limits is open to all, but the city center terminal at the Haram al Sharif, used mainly by buses to Jeddah, is restricted to Muslims only. Local buses, taxis, and micro-buses are widely available in Mecca and are inexpensive. There are no train stations or any metros in Mecca. Sacred Mosque (al-Masjid al-Haram). The holiest site in Mecca and Islam. This mosque is built around Kaaba. Kaaba. At the center of the sacred mosque is this building, said to have been built by Prophet Abraham himself and his son,Prophet Ishmael. Covered in black cloth, it is circled seven times by Muslim pilgrims. Mina. The site of the symbolic stoning of the Devil. Hill of Arafat. The site of Prophet Muhammad's last sermon. Jabal Al Noor (lit. The Mountain of Light). While its not part of the Hajj ritual this is still an important site; since atop this mountain is the famous Her'aa grotto, where Muslims believe Muhammed first had the Quran revealed to him. Muzdalifah The desert where the pilgrims spend the night. Visit Ghar Hira,where the first verse of the Quran was revealed to the last of the prophets,Prophet Mohammed. Pray and Read Quran at the Kaaba. Shopping in the city is widely available. Bargaining is always an option when shopping locally. Visit Mina and the site of Stoning the devil. While in Mekkah many pilgrims purchase trinkets to remember their time, and souvenirs to bring back to family and friends. Zamzam water is available free which is consumed in Mekkah and brought home as a souvenir. Other items to buy in and around Mekkah are: Prayer mats and hats, prayer beads and perfume. There are many types of food from all over the world available in Mecca, from the Middle Eastern Arab food to Southeast Asian food. There are also American fast food chains such as Kentucky Fried Chicken and Dunkin Donuts. No type of pork, ham or any part of the pig is served in Saudi Arabia as forbidden by Islamic Law. Alcohol is illegal in Saudi Arabia. All intoxicants are forbidden by the Qur'an and therefore under Islamic Law which Saudi Arabia follows alcohol is not permitted. Zamzam Water- holy water from the Zamzam spring in Masjid al Haram believed to be divinely blessed is preferred among pilgrims to Mekkah. There are many tea shops that serve tea and cookies. Also many juice vendors right outside the Mosque that sell Apple, Mango and Strawberry Juice for 1 SAR. Mecca is full of hotels, from the Hilton to unknown hotels with various facilities. The price varies according to the hotel's distance from the Holy Mosque. Some of the world's greatest hotels are situated in Mecca, and are full year-round. Make sure to book early, as soon as you know your dates of travel. Despite strict crowd control measures, overcrowding and stampedes are major hazards during the month of the Hajj, killing tens of people. Mina, Jamrat and the bridges leading to them are known to be particularly dangerous, although steps have been taken to alleviate this: there are now four parallel bridges and the route is now unidirectional. During the Hajj crowds pickpockets are not uncommon. Avoid having any valuables on your person when traversing through the crowds. In other words, be on the safe side and don't take chances. Most pilgrims also visit Medina, Islam's second holiest city. MECCA (Arab. Makkah),' the chief town of the Hejaz in Arabia, and the great holy city of Islam. It is situated two camel marches (the resting-place being Bahra or Hadda), or about 45 m. almost due E., from Jidda on the Red Sea. Thus on a rough estimate Mecca lies in 2 1° 25' N., 39° 50' E. It is said in the Koran (Sur. xiv. 40) that Mecca lies in a sterile valley, and the old geographers observe that the whole Haram or sacred territory round the city is almost without cultivation or date palms, while fruit trees, springs, wells, gardens and green valleys are found immediately beyond. Mecca in fact lies in the heart of a mass of rough hills, intersected by a labyrinth of narrow valleys and passes, and projecting into the Tehama or low country on the Red Sea, in front of the great mountain wall that divides the coast-lands from the central plateau, though in turn they are themselves separated from the sea by a second curtain of hills forming the western wall of the great Wadi Marr. The inner mountain wall is pierced by only two great passes, and the valleys descending from these embrace on both sides the Mecca hills. 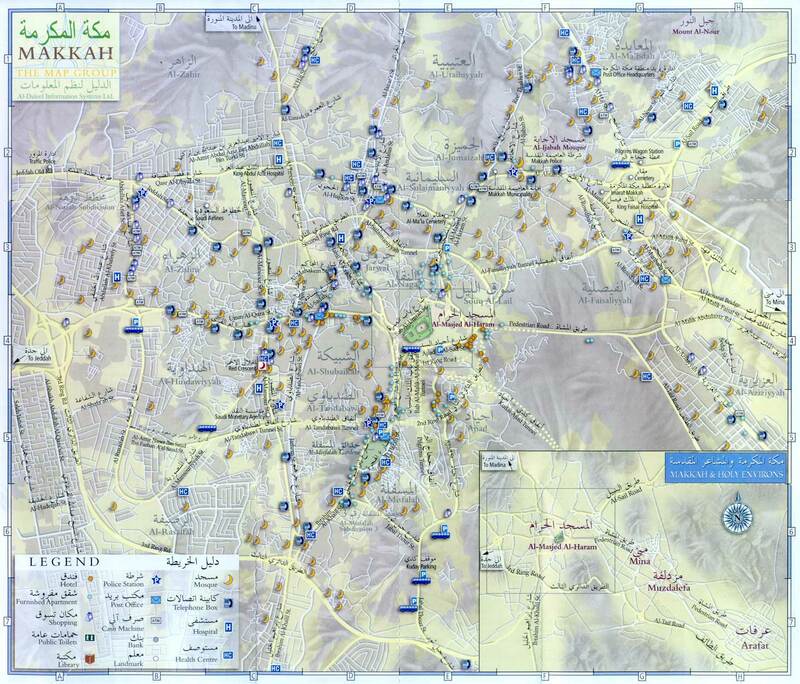 Holding this position commanding two great routes between the lowlands and inner Arabia, and situated in a narrow and 1 A variant of the name Makkah is Bakkah (Sur. iii. 90; Bakri, 155 seq.). For other names and honorific epithets of the city see Bakri, ut supra, Azraqi, p. 197, Yaqut iv. 617 seq. The lists are in part corrupt, and some of the names (Kutha and `Arsh or `Ursh, "the huts") are not properly names of the town as a whole. barren valley incapable of supporting an urban population, Mecca must have been from the first a commercial centre. 2 In. the palmy days of South Arabia it was probably a station on the great incense route, and thus Ptolemy may have learned the name, which he writes Makoraba. At all events, long before Mahomet we find Mecca established in the twofold quality of a commercial centre and a privileged holy place, surrounded by an inviolable territory (the Haram), which was not the sanctuary of a single tribe but a place of pilgrimage, where religious observances were associated with a series of annual fairs at different points in the vicinity. Indeed in the unsettled state of the country commerce was possible only under the sanctions of religion, and through the provisions of the sacred truce which prohibited war for four months of the year, three of these being the month of pilgrimage, with those immediately preceding and following. The first of the series of fairs in which the Meccans had an interest was at Okaz on the easier road between Mecca and Taif, where there was also a sanctuary, and from it the visitors moved on to points still nearer Mecca (Majanna, and finally Dhul-Majaz, on the flank of Jebel Kabkab behind Arafa) where further fairs were held, 3 culminating in the special religious ceremonies of the great feast at `Arafa, Quzah (Mozdalifa), and Mecca itself. The system of intercalation in the lunar calendar of the heathen Arabs was designed to secure that the feast should always fall at the time when the hides, fruits and other merchandise were ready for market, 4 and the Meccans, who knew how to attract the Bedouins by hospitality, bought up these wares in exchange for imported goods, and so became the leaders of the international trade of Arabia. Their caravans traversed the length and breadth of the peninsula. Syria, and especially Gaza, was their chief goal. The Syrian caravan intercepted, on its return, at Badr (see Mahomet) represented capital to the value of X20,000, an enormous sum for those days.' The victory of Mahommedanism made a vast change in the position of Mecca. The merchant aristocracy became satraps or pensioners of a great empire; but the seat of dominion was removed beyond the desert, and though Mecca and the Hejaz strove for a time to maintain political as well as religious predominance, the struggle was vain, and terminated on the death of Ibn Zubair, the Meccan pretendant to the caliphate, when the city was taken by Hajjaj (A.D. 692). The sanctuary and feast of Mecca received, however, a new prestige from the victory of Islam. Purged of elements obviously heathen, the Ka`ba became the holiest site, and the pilgrimage the most sacred ritual observance of Mahommedanism, drawing worshippers from so wide a circle that the confluence of the petty traders of the desert was no longer the main feature of the holy season. The pilgrimage retained its importance for the commercial well-being of Mecca; to this day the Meccans live by the Hajj - letting rooms, acting as guides and directors in the sacred ceremonies, as contractors and touts for land and sea transport, as well as exploiting the many benefactions that flow to the holy city; while the surrounding Bedouins derive support from the camel-transport it demands and from the subsidies by which they are engaged to protect or abstain from molesting the pilgrim caravans. But the ancient "fairs of heathenism" were given up, and the traffic of the pilgrim season, sanctioned by the Prophet in Sur. H. 194, was concentrated. at Mina and Mecca, where most of the pilgrims still have something to buy or sell, so that Mina, after the sacrifice of the feast day, presents the aspect of a huge international fancy 2 Mecca, says one of its citizens, in Wagidi (Kremer's ed., p. 196, or Muh. in Med, p. too), is a settlement formed for trade with Syria in summer and Abyssinia in winter, and cannot continue to exist if the trade is interrupted. 3 The details are variously related. See Biruni, p. 328 (E. T., p. 324);: Asma`i in Yaqut, iii. 705, iv. 416, 421; Azraqi, p. 129 seq. ; Bakri, p. 661. Jebel Kabkab is a great mountain occupying the angle between W. Naman and the plain of Arafa. The peak is due north of Sheddad, the hamlet which Burckhardt (i. 115) calls Shedad. According to Azraqi, p. 80, the last shrine visited was that of the three trees of Uzza in W. Nakhla. So we are told by Biruni, p. 62 (E. T., 73). 5 Wagidi, ed. Kremer, pp. 20, 21; Muh. in Med. p. 39. fair.' In the middle ages this trade was much more important than it is now. Ibn Jubair (ed. Wright, p. 118 seq.) in the r 2th century describes the mart of Mecca in the eight days following the feast as full of gems, unguents, precious drugs, and all rare merchandise from India, Irak, Khorasan, and every part of the Moslem world. The hills east and west of Mecca, which are partly built over and rise several hundred feet above the valley, so enclose the city that the ancient walls only barred the valley at three points, where three gates led into the town. In the time of Ibn Jubair the gates still stood though the walls were ruined, but now the gates have only left their names to quarters of the town. At the northern or upper end was the Bab el Ma`la, or gate of the upper quarter, whence the road continues up the valley towards Mina and Arafa as well as towards Zeima and the Nejd. Beyond the gate, in a place called the Hajun, is the chief cemetery, commonly called el Ma'la, and said to be the resting-place of many of the companions of Mahomet. Here a cross-road, running over the hill to join the main Medina road from the western gate, turns off to the west by the pass of Kada, the point from which the troops of the Prophet stormed the city (A.H. 8). 2 Here too the body of Ibn Zubair was hung on a cross by Hajjaj. The lower or southern gate, at the Masfala quarter, opened on the Yemen road, where the rain-water from Mecca flows off into an open valley. Beyond, there are mountains on both sides; on that to the east, commanding the town, is the great castle, a fortress of considerable strength. The third or western gate, Bab elOmra (formerly also Bab el-Zahir, from a village of that name), lay almost opposite the great mosque, and opened on a road leading westwards round the southern spurs of the Red Mountain. This is the way to Wadi Fatima and Medina, the Jidda road branching off from it to the left. Considerable suburbs now lie outside the quarter named after this gate; in the middle ages a pleasant country road led for some miles through partly cultivated land with good wells, as far as the boundary of the sacred territory and gathering place of the pilgrims at Tanim, near the mosque of Ayesha. This is the spot on the Medina road .now called the Omra, from a ceremonial connected with it which will be mentioned below. The length of the sinuous main axis of the city from the farthest suburbs on the Medina road to the suburbs in the extreme north, now frequented by Bedouins, is, according to Burckhardt, 3500 paces. 3 About the middle of this line the longitudinal thoroughfares are pushed aside by the vast courtyard and colonnades composing the great mosque, which, with its spacious arcades surrounding the Ka`ba and other holy places, and its seven minarets, forms the only prominent architectural feature of the city. The mosque is enclosed by houses with windows opening on the arcades and commanding a view of the Ka`ba. Immediately beyond these, on the side facing Jebel Abu Kobais, a broad street runs south-east and north-west across the valley. This is the Mas'a (sacred course) between the eminences of Safa and Merwa, and has been from very early times one of the most lively bazaars and the centre of Meccan life. The other chief bazaars are also near the mosque in smaller streets. The general aspect of the town is picturesque; the streets are fairly spacious, though ill-kept and filthy; the houses are all of stone, many of them well-built and four or five storeys high, with terraced roofs and large projecting windows as in Jidda - a style of building which has not varied materially since the Toth century (Mukaddasi, p. 71), and gains in effect from the way in which the dwellings run up the sides and spurs of the mountains. Of public institutions there are baths, ribats, or hospices, for poor pilgrims from India, Java, &c., a hospital and a public kitchen for the poor.
' The older fairs were not entirely deserted till the troubles of the last days of the Ornayyads (Azraqi, p. 131). This is the cross-road traversed by Burckhardt (i. 109), and described by him as cut through the rocks with much labour. Istakhri gives the length of the city proper from north to south as m., and the greatest breadth from the Jiyad quarter east of the great mosque across the valley and up the western slopes as twothirds of the length. The mosque is at the same time the university hall, where between two pilgrim seasons lectures are delivered on Mahommedan law, doctrine and connected branches of science. A poorly provided public library is open to the use of students. The madrassehs or buildings around the mosque, originally intended as lodgings for students and professors, have long been let out to rich pilgrims. The minor places of visitation for pilgrims, such as the birthplaces of the prophet and his chief followers, are not notable.' Both these and the court of the great mosque lie beneath the general level of the city, the site having been gradually raised by accumulated rubbish. The town in fact has little air of antiquity; genuine Arab buildings do not last long, especially in a valley periodically ravaged by tremendous floods when the tropical rains burst on the surrounding hills. The history of Mecca is full of the record of these inundations, unsuccessfully combated by the great dam drawn across the valley by the caliph Omar (Kutbeddin, p. 76), and later works of Mandi.5 The fixed population of Mecca in 1878 was estimated by Assistant-Surgeon `Abd el-Razzaq at 50,000 to 60,000; there is a large floating population - and that not merely at the proper season of pilgrimage, the pilgrims of one season often beginning to arrive before those of the former season have all dispersed. At the height of the season the town is much overcrowded, and the entire want of a drainage system is severely felt. Fortunately good water is tolerably plentiful; for, though the wells are mostly undrinkable, and even the famous Zamzam water only available for medicinal or religious purposes, the underground conduit from beyond Arafa, completed by Sultan Selim II. in 1571, supplies to the public fountains a sweet and light water, containing, according to `Abd el-Razzaq, a large amount of chlorides. The water is said to be free to townsmen, but is sold to the pilgrims at a rather high rate.6 Medieval writers celebrate the copious supplies, especially of fine fruits, brought to the city from Taff and other fertile parts of Arabia. These fruits are still famous; rice and other foreign products are brought by sea to Jidda; mutton, milk and butter are plentifully supplied from the desert.' The industries all centre in the pilgrimage; the chief object of every Meccan - from the notables and sheikhs, who use their influence to gain custom for the Jidda speculators in the pilgrim traffic, down to the cicerones, pilgrim brokers, lodging-house keepers, and mendicants at the holy places - being to pillage the visitor in every possible way. The fanaticism of the Meccan is an affair of the purse; the mongrel population (for the town is by no means purely Arab) has exchanged the virtues of the Bedouin for the worst corruptions of Eastern town life, without casting off the ferocity of the desert, and it is hardly possible to find a worse certificate of character than the three parallel gashes on each cheek, called Tashrit, which are the customary mark of birth in the holy city. The unspeakable vices of Mecca are a scandal to all Islam, and a constant source of wonder to pious pilgrims.8 The slave trade has connexions with the pilgrimage which are not thoroughly clear; but under cover of the pilgrimage a great deal of importation and exportation of slaves goes on. Since the fall of Ibn Zubair the political position of Mecca 4 For details as to the ancient quarters of Mecca, where the several families or septs lived apart, see Azraqi, 455 pp. seq., and compare Ya`qubi, ed. Juynboll, p. r oo. The minor sacred places are described at length by Azraqi and Ibn Jubair. They are either connected with genuine memories of the Prophet and his times, or have spurious legends to conceal the fact that they were originally holy stones, wells, or the like, of heathen sanctity. 5 Baladhuri, in his chapter on the floods of Mecca (pp. 53 seq. ), says that `Omar built two dams. The aqueduct is the successor of an older one associated with the names of Zobaida, wife of Harun al-Rashid, and other benefactors. But the old aqueduct was frequently out of repair, and seems to have played but a secondary part in the medieval water supply. Even the new aqueduct gave no adequate supply in Burckhardt's time. In Ibn Jubair's time large supplies were brought from the Yemen mountains. 8 The corruption of manners in Mecca is no new thing. See the letter of the caliph Mandi on the subject; Wustenfeld, Chron. Mek., iv. 168.
has always been dependent on the movements of the greater Mahommedan world. In the splendid times of the caliphs immense sums were lavished upon the pilgrimage and the holy city; and conversely the decay of the central authority of Islam brought with it a long period of faction, wars and misery, in which the most notable episode was the sack of Mecca by the Carmathians at the pilgrimage season of A.D. 930. The victors carried off the "black stone," which was not restored for twentytwo years, and then only for a great ransom, when it was plain that even the loss of its palladium could not destroy the sacred character of the city. Under the Fatimites Egyptian influence began to be strong in Mecca; it was opposed by the sultans of Yemen, while native princes claiming descent from the Prophet - the Hashimite amirs of Mecca, and after them the amirs of the house of Qatada (since 1202) - attained to great authority and aimed at independence; but soon after the final fall of the Abbasids the Egyptian overlordship was definitely established by sultan Bibars (A.D. 1269). The Turkish conquest of Egypt transferred the supremacy to the Ottoman sultans (1517), who treated Mecca with much favour, and during the 16th century executed great works in the sanctuary and temple. The Ottoman power, however, became gradually almost nominal, and that of the amirs or sherifs increased in proportion, culminating under Ghalib, whose accession dates from 1786. Then followed the wars of the Wahhabis (see Arabia and WAHHABis) and the restoration of Turkish rule by the troops of Mehemet `Ali. By him the dignity of sherif was deprived of much of its weight, and in 1827 a change of dynasty was effected by the appointment of Ibn `Aun. Afterwards Turkish authority again decayed. Mecca is, however, officially the capital of a Turkish province, and has a governor-general and a Turkish garrison, while Mahommedan law is administered by a judge sent from Constantinople. But the real sovereign of Mecca and the Hejaz is the sherif, who, as head of a princely family claiming descent from the Prophet, holds a sort of feudal position. The dignity of sherif (or grand sherif, as Europeans usually say for the sake of distinction, since all the kin of the princely houses reckoning descent from the Prophet are also named sherifs), although by no means a religious pontificate, is highly respected owing to its traditional descent in the line of Hasan, son of the fourth caliph `Ali. From a political point of view the sherif is the modern counterpart of the ancient amirs of Mecca, who were named in the public prayers immediately after the reigning caliph. When the great Mahommedan sultanates had become too much occupied in internecine wars to maintain order in the distant Hejaz, those branches of the Hassanids which from the beginning of Islam had retained rural property in Arabia usurped power in the holy cities and the adjacent Bedouin territories. About A.D. 960 they established a sort of kingdom with Mecca as capital. The influence of the princes of Mecca has varied from time to time, according to the strength of the foreign protectorate in the Hejaz or in consequence of feuds among the branches of the house; until about 1882 it was for most purposes much greater than that of the Turks. The latter were strong enough to hold the garrisoned towns, and thus the sultan was able within certain limits - playing off one against the other the two rival branches of the aristocracy, viz. the kin of Ghalib and the house of Ibn`Aun - to assert the right of designating or removing the sherif, to whom in turn he owed the possibility of maintaining, with the aid of considerable pensions, the semblance of his much-prized lordship over the holy cities. The grand sherif can muster a considerable force of freedmen and clients, and his kin, holding wells and lands in various places through the Hejaz, act as his deputies and administer the old Arabic customary law to the Bedouin. To this influence the Hejaz owes what little of law and order it enjoys. During the last quarter of the 19th century Turkish influence became preponderant in western Arabia, and the railway from Syria to the Hejaz tended to consolidate the sultan's supremacy. After the sherifs, the principal family of Mecca is the house of Shaibah, which holds the hereditary custodianship of the Ka`ba. Long before Mahomet the chief sanctuary of Mecca was the Ka`ba, a rude stone building without windows, and having a door 7 ft. from the ground; and so named from its resemblance to a monstrous astragalus (die) of about 40 ft. cube, though the shapeless structure is not really an exact cube nor even exactly rectangular.' The Ka`ba has been rebuilt more than once since Mahomet purged it of idols and adopted it as the chief sanctuary of Islam, but the old form has been preserved, except in secondary details;2 so that the "Ancient House," as it is titled, is still essentially a heathen temple, adapted to the worship of Islam by the clumsy fiction that it was built by Abraham and Ishmael by divine revelation as a temple of pure monotheism, and that it was only temporarily perverted to idol worship from the time when `Amr ibn Lohai introduced the statue of Hobal from Syria' till the victory of Islam. This fiction has involved the superinduction of a new mythology over the old heathen ritual, which remains practically unchanged. Thus the chief object of veneration is the black stone, which is fixed in the external angle facing Said. The building is not exactly oriented, but it may be called the south-east corner. Its technical name is the black corner, the others being named the Yemen (southwest), Syrian (north-west), and Irak (north-east) corners, from the lands to which they approximately point. The black stone is a small dark mass a span long, with an aspect suggesting volcanic or meteoric origin, fixed at such a height that it can be conveniently kissed by a person of middle size. It was broken by fire in the siege of A.D. 683 (not, as many authors relate, by the Carmathians), and the pieces are kept together by a silver setting. The history of this heavenly stone, given by Gabriel to Abraham, does not conceal the fact that it was originally a fetish, the most venerated of a multitude of idols and sacred stones which stood all round the sanctuary in the time of Mahomet. The Prophet destroyed the idols, but he left the characteristic form of worship - the tawdf, or sevenfold circuit of the sanctuary, the worshipper kissing or touching the objects of his veneration - and besides the black stone 1e recognized the so-called "southern" stone, the same presumably as that which is still touched in the tawaf at the Yemen corner (Muh. in Med. pp. 336, 425). The ceremony of the tawaf and the worship of stone fetishes was common to Mecca with other ancient Arabian sanctuaries.' It was, as it still is, a frequent religious exercise of the Meccans, and the first duty of one who returned to the city or arrived there under a vow of pilgrimage; and thus the outside of the Ka`ba was and is more important than the inside. Islam did away with the worship of idols; what was lost in interest by their suppression ' The exact measurements (which, however, vary according to different authorities) are stated to be: sides 37 ft. 2 in. and 38 ft. 4 in. ; ends 31 ft. 7 in. and 29 ft.; height 35 ft. The Ka`ba of Mahomet's time was the successor of an older building, said to have been destroyed by fire. It was constructed in the still usual rude style of Arabic masonry, with string courses of timber between the stones (like Solomon's Temple). The roof rested on six pillars; the door was raised above the ground and approached by a stair (probably on account of the floods which often swept the valley); and worshippers left their shoes under the stair before entering. During the first siege of Mecca (A.D. 683), the building was burned down, the Ibn Zubair reconstructed it on an enlarged scale and in better style of solid ashlar-work. After his death his most glaring innovations (the introduction of two doors on a level with the ground, and the extension of the building lengthwise to include the Hijr) were corrected by Hajjaj, under orders from the caliph, but the building retained its more solid structure. The roof now rested on three pillars, and the height was raised one-half. The Ka`ba was again entirely rebuilt after the flood of A.D. 1626, but since Hajjaj there seem to have been no structural changes. 3 Hobal was set up within the Temple over the pit that contained the sacred treasures. His chief function was connected with the sacred lot to which the Meccans were accustomed to betake themselves in all matters of difficulty. 4 See Ibn Hisham i. 54, Azraki p. 80 ('Uzza in Batn Marr); Yal ut iii. 705 (Otheyda); Bar Hebraeus on Psalm xii. 9. Stones worshipped by circling round them bore the name dawar or duwar (Krehl, Rel. d. Araber, p. 69). The later Arabs not unnaturally viewed such cultus as imitated from that of Mecca (Yaqut iv. 622, cf. Dozy, Israeliten to Mekka, p. 125, who draws very perverse inferences). has been supplied by the invention of spots consecrated by recollections of Abraham, Ishmael and Hagar, or held to be acceptable places of prayer. Thus the space of ten spans between the black stone and the door, which is on the east side, between the black and Irak corners, and a man's height from the ground, is called the Multazam, and here prayer should be offered after the tawaf with outstretched arms and breast pressed against the house. On the other side of the door, against the same wall, is a shallow trough, which is said to mark the original site of the stone on which Abraham stood to build the Ka`ba. Here the growth of the legend can be traced, for the place is now called the "kneading-place" (Ma`jan), where the cement for the Ka`ba was prepared. This name and story do not appear in the older accounts. Once more, on the north side of the Ka`ba, there projects a low semicircular wall of marble, with an opening at each end between it and the walls of the house. The space within is paved with mosaic, and is called the I;Iijr. It is included in the tawaf, and two slabs of verde antico within it are called the graves of Ishmael and Hagar, and are places of acceptable prayer. Even the golden or gilded mizab (water-spout) that projects into the IIijr marks a place where prayer is heard, and another such place is the part of the west wall close to the Yemen corner. The feeling of religious conservatism which has preserved the structural rudeness of the Ka`ba did not prohibit costly surface decoration. In Mahomet's time the outer walls were covered by a veil (or kiswa) of striped Yemen cloth. The caliphs substituted a covering of figured brocade, and the Egyptian government still sends with each pilgrim caravan from Cairo a new kiswa of black brocade, adorned with a broad band embroidered with golden inscriptions from the Koran, as well as a richer curtain for the door.' The door of two leaves, with its posts and lintel, is of silver gilt. The interior of the Ka`ba is now opened but a few times every year for the general public, which ascends by the portable staircase brought forward for the purpose. Foreigners can obtain admission at any time for a special fee. The modern descriptions, from observations made under difficulties, are not very complete. Little change, however, seems to have been made since the time of Ibn Jubair, who describes the floor and walls as overlaid with richly variegated marbles, and the upper half of the walls as plated with silver thickly gilt, while the roof was veiled with coloured silk. Modern writers describe the place as windowless, but Ibn Jubair mentions five windows of rich stained glass from Irak. Between the three pillars of teak hung thirteen silver lamps. A chest in the corner to the left of one entering contained Korans, and at the Irak corner a space was cut off enclosing the stair that leads to the roof. The door to this stair (called the door of mercy - Bab el-Rahma) was plated with silver by the caliph Motawakkil. Here, in the time of Ibn Jubair, the Maqam or standing stone of Abraham was usually placed for better security, but brought out on great occasions.2 The houses of ancient Mecca pressed close upon the Ka`ba, the noblest families, who traced their descent from Iosai, the reputed founder of the city, having their dwellings immediately round the sanctuary. To the north of the Ka`ba was the Dar el-Nadwa, or place of assembly of the Koreish. The multiplication of pilgrims after Islam soon made it necessary to clear away the nearest dwellings and enlarge the place of prayer around the Ancient House. Omar, Othman and Ibn Jubair had all a share in this work, but the great founder of the mosque in its present form, with its spacious area and deep ' The old kiswa is removed on the 25th day of the month before the pilgrimage, and fragments of it are bought by the pilgrims as charms. Till the 10th day of the pilgrimage month the Ka`ba is bare. z Before Islam the Ka`ba was opened every Monday and Thursday; in the time of Ibn Jubair it was opened with considerable ceremony every Monday and Friday, and daily in the month Rajab. But, though prayer within the building is favoured by the example of the Prophet, it is not compulsory on the Moslem, and even in the time of Ibn Batuta the opportunities of entrance were reduced to Friday and the birthday of the Prophet. colonnades, was the caliph Mandi, who spent enormous sums in bringing costly pillars from Egypt and Syria. The work was still incomplete at his death in A.D. 7 8 5, and was finished in less sumptuous style by his successor. Subsequent repairs and additions, extending down to Turkish times, have left little of Mandi's work untouched, though a few of the pillars probably date from his days. There are more than five hundred pillars in all, of very various style and workmanship, and the enclosure-250 paces in length and 200 in breadth, according to Burckhardt's measurement - is entered by nineteen archways irregularly disposed. After the Ka`ba the principal points of interest in the mosque are the well Zamzam and the Maqam Ibrahim. The former is a deep shaft enclosed in a massive vaulted building paved with marble, and, according to Mahommedan tradition, is the source (corresponding to the Beer-lahai-roi of Gen. xvi. 14) from which Hagar drew water for her son Ishmael. The legend tells that the well was long covered up and rediscovered by `Abd al-Mottalib, the grandfather of the Prophet. Sacred wells are familiar features of Semitic sanctuaries, and Islam, retaining the well, made a quasi-biblical story for it, and endowed its tepid waters with miraculous curative virtues. They are eagerly drunk by the pilgrims, or when poured over the body are held to give a miraculous refreshment after the fatigues of religious exercise; and the manufacture of bottles or jars for carrying the water to distant countries is quite a trade. Ibn Jubair mentions a curious superstition of the Meccans, who believed that the water rose in the shaft at the full moon of the month Shaban. On this occasion a great crowd, especially of young people, thronged round the well with shouts of religious enthusiasm, while the servants of the well dashed buckets of water over their heads. The Maqam of Abraham is also connected with a relic of heathenism, the ancient holy stone which once stood on the Ma`jan, and is said to bear the prints of the patriarch's feet. The whole legend of this stone, which is full of miraculous incidents, seems to have arisen from a misconception, the Maqam Ibrahim in the Koran meaning the sanctuary itself; but the stone, which is a block about 3 spans in height and 2 in breadth, and in shape "like a potter's furnace" (Ibn Jubair), is certainly very ancient. No one is now allowed to see it, though the box in which it lies can be seen or touched through a grating in the little chapel that surrounds it. In the middle ages it was sometimes shown, and Ibn Jubair describes the pious enthusiasm with which he drank Zamzam water poured on the footprints. It was covered with inscriptions in an unknown character, one of which was copied by Fakihi in his history of Mecca. To judge by the facsimile in Dozy's Israeliten to Mekka, the character is probably essentially one with that of the Syrian Sala inscriptions, which extended through the Nejd and into the Hejaz.3 Safa and Merwa. - In religious importance these two points or "hills," connected by the A /lab-a, stand second only to the Ka`ba. Sala is an elevated platform surmounted by a triple arch, and approached by a flight of steps. 4 It lies south-east of the Ka`ba, facing the black corner, and 76 paces from the "Gate of Sala," which is architecturally the chief gate of the mosque. Merwa is a similar platform, formerly covered with a single arch, on the opposite side of the valley. It stands on a spur of the Red Mountain called Jebel Kuaylian. The course between these two sacred points is 493 paces long, and the religious ceremony called the "sa`y" consists in traversing it seven times, beginning and ending at Sala. The lowest part of the course, between the socalled green milestones, is done at a run. This ceremony, which, as we shall presently see, is part of the omra, is generally said to be performed in memory of Hagar, who ran to and fro between the two eminences vainly seeking water for her son. The observance, however, is certainly of pagan origin; and at one time there were idols on both the so-called hills (see especially Azraqi, pp. 74, 78). Before Islam the Ka`ba was the local sanctuary of the Meccans, where they prayed and did See De Vogue, Syrie centrale: inscr. sem. ; Lady Anne Blunt Pilgrimage of Nejd, ii., and W. R. Smith, in the Athenaeum, March 20, i 880. 4 Ibn Jubair speaks of fourteen steps, Ali Bey of four, Burckhardt of three. The surrounding ground no doubt has risen so that the old name "hill of Said" is now inapplicable. sacrifice, where oaths were administered and hard cases submitted to divine sentence according to the immemorial custom of Semitic shrines. But, besides this, Mecca was already a place of pilgrimage. Pilgrimage with the ancient Arabs was the fulfilment of a vow, which appears to have generally terminated - at least on the part of the well-to-do - in a sacrificial feast. A vow of pilgrimage might be directed to other sanctuaries than Mecca - the technical word for it (ihlal) is applied, for example, to the pilgrimage to Manat (Bakri, p. 519). He who was under such a vow was bound by ceremonial observances of abstinence from certain acts (e.g. hunting) and sensual pleasures, and in particular was forbidden to shear or comb his hair till the fulfilment of the vow. This old Semitic usage has its close parallel in the vow of the Nazarite. It was not peculiarly connected with Mecca; at Taff, for example, it was customary on return to the city after an absence to present oneself at the sanctuary, and there shear the hair (Muh. in Med., p. 381). Pilgrimages to Mecca were not tied to a single time, but they were naturally associated with festive occasions, and especially with the great annual feast and market. The pilgrimage was so intimately connected with the wellbeing of Mecca, and had already such a hold on the Arabs round about, that Mahomet could not afford to sacrifice it to an abstract purity of religion, and thus the old usages were transplanted into Islam in the double form of the omra or vow of pilgrimage to Mecca, which can be discharged at any time, and the hajj or pilgrimage at the great annual feast. The latter closes with a visit to the Ka`ba, but its essential ceremonies lie outside Mecca, at the neighbouring shrines where the old Arabs gathered before the Meccan fair. The omra begins at some point outside the Haram (or holy territory), generally at Tanim, both for convenience sake and because Ayesha began the omra there in the year 10 of the Hegira. The pilgrim enters the Haram in the antique and scanty pilgrimage dress (ihram), consisting of two cloths wound round his person in a way prescribed by ritual. His devotion is expressed in shouts of "Labbeyka" (a word of obscure origin and meaning; he enters the great mosque, performs the tawaf and the sa'y 1 and then has his head shaved and resumes his common dress. This ceremony is now generally combined with the hajj, or is performed by every stranger or traveller when he enters Mecca, and the ihram (which involves the acts of abstinence already referred to) is assumed at a considerable distance from the city. But it is also proper during one's residence in the holy city to perform at least one omra from Tanim in connexion with a visit to the mosque of Ayesha there. The triviality of these rites is ill concealed by the legends of the sa'y of Hagar and of the tawaf being first performed by Adam in imitation of the circuit of the angels about the throne of God; the meaning of their ceremonies seems to have been almost a blank to the Arabs before Islam, whose religion had become a mere formal tradition. We do not even know to what deity the worship expressed in the tawaf was properly addressed. There is a tradition that the Ka`ba was a temple of Saturn (Shahrastani, p. 431); perhaps the most distinctive feature of the shrine may be sought in the sacred doves which still enjoy the protection of the sanctuary. These recall the sacred doves of Ascalon (Philo vi. 200 of Richter's ed. ), and suggests Venusworship as at least one element (cf. Herod i. 131, iii. 8; Ephr. Syr., Op. Syr. ii. 457). To the ordinary pilgrim the omra has become so much an episode of the hajj that it is described by some European pilgrims as a mere visit to the mosque of Ayesha; a better conception of its original significance is got from the Meccan feast of the seventh month (Rajab), graphically described by Ibn Jubair from his observations in A.D. 1184. Rajab was one of the ancient sacred months, and the feast, which extended through the whole month and was a joyful season of hospitality and thanksgiving, no doubt represents the ancient feasts of Mecca more exactly than the ceremonies of the bajj, in which old usage has been overlaid by traditions and glosses of Islam. The omra was performed by crowds from day to day, especially at new and full moon. 2 The new moon celebration was nocturnal; the road to Tanim, the Mas`a, and the mosque were brilliantly illuminated; and the appearing of the moon was greeted with noisy music. A genuine old Arab market was held, for the wild Bedouins of the Yemen mountains came in thousands to barter their cattle and fruits for clothing, and deemed that to absent themselves would bring drought and cattle plague in their homes. Though ignorant of the legal ritual and prayers, they performed the tawaf with enthusiasm, throwing themselves against the Ka`ba and clinging to its curtains as a child clings to its mother. They also made a point of entering the Ka'ba. The 29th of the month was the feast day of the Meccan women, when they and their little ones had the Ka'ba to themselves without the presence even of the Sheybas. The central and essential ceremonies of the hajj or greater pilgrimage are those of the day of Arafa, the 9th of the "pilgrimage month" (Dhu'l Hijja), the last of the Arab year; and every Moslem who is his own master, and can command the necessary means, is bound to join in these once in his life, or to have them fulfilled by a substitute 1 The latter perhaps was no part of the ancient omra; see SnouckHurgronje, Het Mekkaansche Feest (1880) p. 115 sqq. 2 The 27th was also a great day, but this day was in commemoration of the rebuilding of the Ka'ba by Ibn Jubair. on his behalf and at his expense. By them the pilgrim becomes as pure from sin as when he was born, and gains for the rest of his life the honourable title of bajj. Neglect of many other parts of the pilgrim ceremonial may be compensated by offerings, but to miss the "stand" (woquf) at Arafa is to miss the pilgrimage. Arafa or Arafat is a space, artificially limited, round a small isolated hill called the Hill of Mercy, a little way outside the holy territory, on the road from Mecca to Taif. One leaving Mecca after midday can easily reach the place on foot the same evening. The road is first northwards along the Mecca valley and then turns eastward. It leads through the straggling village of Mina, occupying a long narrow valley (Wadi Mina), two to three hours from Mecca, and thence by the mosque of Mozdalifa over a narrow pass opening out into the plain of Arafa,which is an expansion of the great Wadi Naman,through which the Taif road descends from Mount Kara. The lofty and rugged mountains of the Hodheyl tower over the plain on the north side and overshadow the little Hill of Mercy, which is one of those bosses of weathered granite so common in the Hejaz. Arafa lay quite near Dhul-Majaz, where, according to Arabian tradition, a great fair was held from the 1st to the 8th of the pilgrimage month; and the ceremonies from which the bajj was derived were originally an appendix to this fair. Now, on the contrary, the pilgrim is expected to follow as closely as may be the movements of the prophet at his "farewell pilgrimage" in the year io of the Hegira (A.D. 632). He therefore leaves Mecca in pilgrim garb on the 8th of Dhu'l Hijja, called the day of tarwiya (an obscure and pre-Islamic name), and, strictly speaking, should spend the night at Mina. It is now, however, customary to go right on and encamp at once at Arafa. The night should be spent in devotion, but the coffee booths do a lively trade, and songs are as common as prayers. Next forenoon the pilgrim is free to move about, and towards midday he may if he please hear a sermon. In the afternoon the essential ceremony begins; it consists simply in "standing" on Arafa shouting "Labbeyka" and reciting prayers and texts till sunset. After the sun is down the vast assemblage breaks up, and a rush (technically ifada, daf`,nafr is made in the utmost confusion to Mozdalifa, where the night prayer is said and the night spent. Before sunrise next morning (the loth) a second "stand" like that on Arafa is made for a short time by torchlight round the mosque of Mozdalifa, but before the sun is fairly up all must be in motion in the second ifada towards Mina. The day thus begun is the "day of sacrifice," and has four ceremonies - (I) to pelt with seven stones a cairn (jamrat al `agaba) at the eastern end of W. Mina, (2) to slay a victim at Mina and hold a sacrificial meal, part of the flesh being also dried and so preserved, or given to the poor, 3 (3) to be shaved and so terminate the ihram, (4) to make the third ifada, i.e. go to Mecca and perform the tawaf and sa'y (`omrat al-ifada), returning thereafter to Mina. The sacrifice and visit to Mecca may, however, be delayed till the 11th, 12th or 13th. These are the days of Mina, a fair and joyous feast, with no special ceremony except that each day the pilgrim is expected to throw seven stones at the jamrat al `agaba, and also at each of two similar cairns in the valley. The stones are thrown in the name of Allah, and are generally thought to be directed at the devil. This is, however, a custom older than Islam, and a tradition in Azraqi, p. 412, represents it as an act of worship to idols at Mina. As the stones are thrown on the days of the fair, it is not unlikely that they have something to do with the old Arab mode of closing a sale by the purchaser throwing a stone (Biruni, p. 328). 4 The pilgrims leave Mina on the 12th or 13th, and the hajj is then over. (See further Mahommedan Religion.) The colourless character of these ceremonies is plainly due to the fact that they are nothing more than expurgated heathen rites. In Islam proper they have no raison d'etre; the legends about Adam and Eve on Arafa, about Abraham's sacrifice of the ram at Thabii by Mina, imitated in the sacrifices of the pilgrimage, are clumsy afterthoughts, as appears from their variations and only partial acceptance. It is not so easy to get at the nature of the original rites, which Islam was careful to suppress. But we find mention of practices condemned by the orthodox, or forming no part of the Moslem ritual, which may be regarded as traces of an older ceremonial. Such are nocturnal illuminations at Mina (Ibn Batuta i. 396), Arafa and Mozdalifa (Ibn Jubair, 179), and tawafs performed by the ignorant at holy spots at Arafa not recognized by law (SnouckHurgronje p. 149 sqq.). We know that the rites at Mozdalifa were originally connected with a holy hill bearing the name of the god Quzah (the Edomite Koze) whose bow is the rainbow, and there is reason to think that the ifadas from Arafa and Quzah, which were not made as now after sunset and before sunrise, but when the sun rested on the tops of the mountains, were ceremonies of farewell and salutation to the sun-god. The statistics of the pilgrimage cannot be given with certainty and vary much from year to year. The quarantine office keeps a record of arrivals by sea at Jidda (66,000 for 1904); but to these must be added those travelling by land from Cairo, Damascus The sacrifice is not indispensable except for those who can afford it and are combining the hajj with the omra. 4 On the similar pelting of the supposed graves of Abu Lahab and his wife (Ibn Jubair, p. I io) and of Abu Righal at Mughammas, see Noldeke's translation of Tabari, p. 208.
and Irak, the pilgrims who reach Medina from Yanbu and go on to Mecca, and those from all parts of the peninsula. Burckhardt in 1814 estimated the crowd at Arafa at 70,000, Burton in 1853 at 50,000, `Abd el-Razzak in 1858 at 60,000. This great assemblage is always a dangerous centre of infection, and the days of Mina especially, spent under circumstances originally adapted only for a Bedouin fair, with no provisions for proper cleanliness, and with the air full of the smell of putrefying offal and flesh drying in the sun, produce much sickness. Literature. - Besides the Arabic geographers and cosmographers, we have Ibn `Abd Rabbih's description of the mosque, early in the 10th century (`Led Farid, Cairo ed., iii. 362 sqq. ), but above all the admirable record of Ibn Jubair (A.D. 1184), by far the best account extant of Mecca and the pilgrimage. It has been much pillaged by Ibn Batuta. The Arabic historians are largely occupied with fabulous matter as to Mecca before Islam; for these legends the reader may refer to C. de Perceval's Essai. How little confidence can be placed in the pre-Islamic history appears very clearly from the distorted accounts of Abraha's excursion against the Hejaz, which fell but a few years before the birth of the Prophet, and is the first event in Meccan history which has confirmation from other sources. See Nuldeke's version of Tabari, p. 204 sqq. For the period of the Prophet, Ibn Hisham and Wakidi are valuable sources in topography as well as history. Of the special histories and descriptions of Mecca published by Wi stenfeld (Chroniken der Stadt Mekka, 3 vols., 1857-1859, with an abstract in German, 1861), the most valuable is that of Azragi. It has passed through the hands of several editors, but the oldest part goes back to the beginning of the 9th Christian century. Kutbeddin's history (vol. iii. of the Chroniken) goes down with the additions of his nephew to A.D. 1592. A city in Saudi Arabia, the holiest place in Islam, location of the sacred Ka'ba, and to which Muslims are required to make a hajj at least once in their lifetime. Arabic: مكة‎ ar(ar) (mákka) f., مكة المكرمة ar(ar) (mákkat al-mukárrama) f., مكة المكرِم ar(ar) (mákkat al-múkrim) f.
Macedonian: Мека mk(mk) (Méka) f.
Russian: Мекка ru(ru) (Mékka) f.
Spanish: La Meca es(es) f.
(figuratively) Any place considered to be a very important place to visit by people with a particular interest. 1991, The Economist, The Economist Newspaper Ltd.
On the other side of the Atlantic, stores in Paris's chic Avenue Montaigne, a mecca for Japanese tourists, said that sales to foreigners had fallen sharply. 1997, John Romano, Muscle Meals, page 14. Living in Venice, California and training at the Mecca of bodybuilding, Gold's Gym, I've seen some of the world's most dedicated and hard-training athletes. Mecca or Makkah (called Mecca in older texts (officially: Makkah al-Mukarramah; Arabic: مكة المكرمة‎) is a city in Saudi Arabia. It has a population of 1,294,169 (2004 census). The city is located 73 kilometres (45 mi) inland from Jeddah, in the narrow sandy Valley of Abraham, 277 metres (909 ft) above sea level. It is located 81 kilometres (50 mi) from the Red Sea. Mecca is the holiest city in the Islamic world. Every year, millions of Muslims take a pilgrimage to Mecca. This is called the Hajj, where they follow in the footsteps of Muhammad. All Muslims who are able to do so are expected to do the Hajj at least once in their life. The Kaaba and Masjid al-Haram, the holiest mosque in Islam is situated here. Mecca is closed to non-Muslims except some journalists reporting on the Hajj. The Kaaba, the small cubical building which Muslims pray towards is believed to have been built by Ibrahim and has been a religious center ever since. Muslims believed that God commanded Ibrahim to send his second wife Hajar and her son Ismail there. They found the Zamzam Well which led to people settling nearby, and thus Makkah was born. When Ismail was big enough, he helped his father to build the Kaaba. The kaaba is the place that the Muslims pray towards. This is known as the Qibla and this is the only place which Muslims can pray towards. American Heritage® Dictionary of the English Language, Fourth Edition copyright ©2000 by Houghton Mifflin Company. 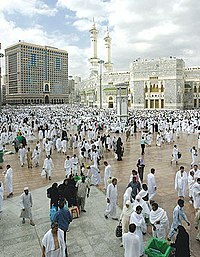 - Mecca - definition of Mecca by the Free Online Dictionary, Thesaurus and Encyclopedia.